In Sadhana, the Essential Element, Jot Singh Khalsa clearly explains the process of tapping into the healing and calming capacities of your own breath. He shows how to nurture and respect your body, as the vehicle carrying your spirit to a place where your heart and soul hope to go. Doing so will develop within you a deep sense of gratitude for the natural vitality gained through a steady, powerful Kundalini Yoga practice. These meditative successes enrich your being and help you surf over the inevitable ups and downs, ins and outs, wins and losses of life. You may practice Kundalini Yoga at any time of the day or night, but you will discover that those before-sunrise hours when the air is cleanest, quietest and most peaceful, when human ambition, greed, anger and hostility still slumber, the ‘ambrosial hours’ are the most precious and effective. At such times you can join the exalted company of yogis and other devoted beings who grace the planet. "This is the best book I've ever seen on this subject. It is excellently written and profound, revealing a roadmap to peace, comfort and vitality during these hectic times. 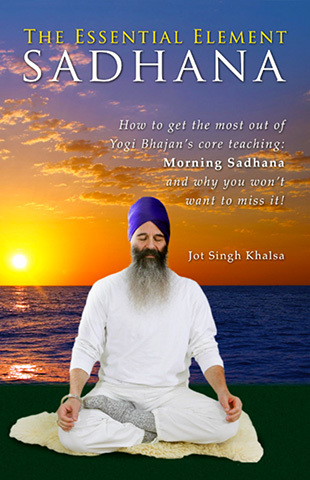 Sadhana is clearly the most important thing you can do for yourself and in The Essential Element, SS Jot Singh Khalsa shows us the ins and outs of it. It is absolutely a must read!" - Dharma Singh Khalsa, M.D. Author of Meditation as Medicine and other books. Regular sadhana practice will fine tune timing, telepathy, pre-cognition, harmonize interactions between the inner and outer worlds, produce a positive attitude, a happy disposition and success! It will build a deep reservoir of poise, self-acceptance and self-confidence, and one that will naturally overflow in a fountain of compassion, courage, wisdom and smiles for those who count on your trustworthy radiance. You will become a force for good on this Earth. Become the new you. Start today by ordering a copy of Sadhana, The Essential Element! Jot Singh enjoys teaching around new paradigms of prosperity, the importance of being a spiritual warrior/saint soldier in today’s society, and utilizing one’s unique gifts to authentically fulfill one’s destiny. He also enjoys facilitating and participating in men’s groups. His hobbies include downhill skiing, bicycling, swimming and the martial arts.